The gear shifts are detected by the Flatshifter Gear Shift Sensor which is fitted in place of the existing gear shift rod, or in the gear shift linkage This senses the force and direction applied to the gear lever and passes a signal back to the control unit every time the gear lever is operated indicating an upshift or downshift is required. When the gear lever is operated in the upshift direction the shift rod sends a signal to the control unit when a pre-set amount of force has been applied to the gear lever. The control unit momentarily ‘kills’ the engine by disconnecting the power to the ignition coils or fuel injection, this removes the torque from the gearbox allowing the gears to move, giving a virtually instant gear shift. The control unit then re-connects the supply allowing the engine to run again. The kill time is typically around 60ms but may be adjusted on the control unit. The control unit also has a 250ms lockout time immediately after the kill time to prevent multiple triggering caused by bumpy road surfaces or friction in the gear linkage. Shifts can be made smoothly and quickly at part or full throttle. By operating the gear lever in the downshifting direction, the patented throttle blip system allows a smooth downshift to be made at all speeds without the need for a slipper clutch. The downshift actuator spindle replaces the original engine idle adjuster screw and provides a precise throttle-blip of the correct level to ensure a smooth downshift (up to 4 in 1 second.) The system has a built-in inhibitor which helps prevent rear wheel locking or engine damage caused by shifting down at too high engine speed. The Flatshifter Auto Throttle Blip down shifter employs a patented system which powers and automatically regulates downshifting using engine vacuum. The operation of the system is based on the principle that engine inlet manifold vacuum is approximately proportional to engine load when a vehicle is coasting with the throttle closed. The throttle blip control box houses a valve which, when triggered by the main control box, feeds a timed and regulated pulse of engine vacuum to the throttle blipper which in turn blips the throttle by a controlled amount depending on engine load and rpm. This gives seamless automatic control downshifts at all speeds with only one variable adjuster which varies the level of blip to suit the driver’s preference from aggressive to passive downshifting and everything in-between. The system has a built-in maximum blip limit to prevent over-revving when downshifts are made too quickly by inhibiting gear-lever movement until the engine rpm has fallen to a safe level for the next downshift. The Flatshifter Auto Throttle Blip down shifter employs a patented system which powers and automatically regulates downshifting using engine vacuum. The operation of the system is based on the principle that engine inlet manifold vacuum is approximately proportional to engine load when a vehicle is coasting with the throttle closed. Installation is simple as the shifter does not require a gear position indicator or engine and wheel speed sensors or even a computer to set everything up. The throttle blipper replaces either the idle control screw or the redundant closing throttle cable on fly-by-wire engines. This down shifter is uncomplicated, compact, lightweight, and because it is powered by engine vacuum it is very fast with the capability of up to four downshifts per second. The system is incorporated into the Flatshifter Expert and Pro shifter kits or can be supplied for downshift-only as the Flatshifter ‘Blip’ kit. Installation is simple as the shifter does not require a gear position indicator or engine and wheel speed sensors or even a computer to set everything up. 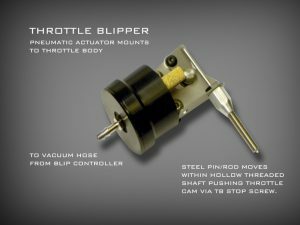 The throttle blipper replaces either the idle control screw or the redundant closing throttle cable on fly-by-wire engines. This down shifter is uncomplicated, compact, lightweight, and because it is powered by engine vacuum it is very fast with the capability of up to four down shifts per second. Flatshifter lets you concentrate on your driving not on adjustments. The control unit also provides a visual LED indication of the gearshift and an audible beep to help speed up the initial installation, setting up and testing of the system.